Organic, raw, gluten free, vegan, kosher, and dairy-free. It’s been a couple weeks since I had a RawRev bar and, since the Chocolate Raspberry Truffle was so amazing, I decided to try out another bar by Raw Revolution. 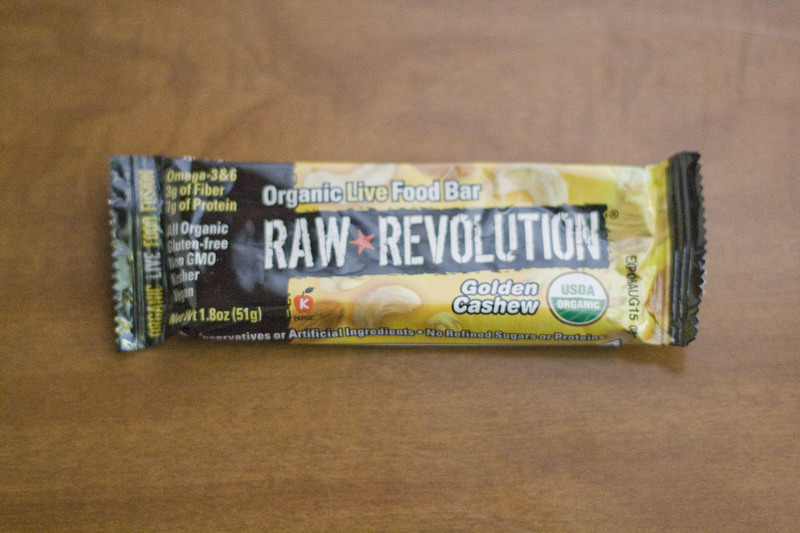 This time I tried the Golden Cashew with very high hopes after how delicious the last one by RawRev was, but I was a bit disappointed. The Golden Cashew bar wasn’t bad, not by any means or measure, but it also wasn’t particularly better than anything else I have reviewed. It packed in less flavor than the other bar by RawRev which is nutritionally identical, which means this bar is rather mediocre by comparison, it tasted like a lame version of GoMacro’s Peanut Butter Chocolate Chip protein bar but with no chocolate chips. With no chocolate at all this is a very desert friendly protein bar, but it also doesn’t really have much flavor past the cashews. This bar, like the Chocolate Raspberry Truffle, is one of the few I have come across that was actually made in a gluten free facility, this makes it ideal for people who have extreme allergies to gluten and need to be extra certain that something is entirely gluten free. If nothing else, that is a selling point for the Golden Cashew bar.